Nick and Andrew put on Isaac and John's helmets. 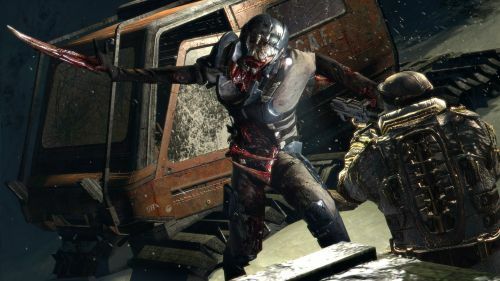 The "exclusive" Dead Space 3 demo was released yesterday on Xbox Live, that is if you managed to get a code for it. Last night Andrew and I tackled it head on, myself jumping into the boots of Isaac Clarke and Andrew playing as John Carver. While I'm a Dead Space veteran having played both the original games, Andrew has only brief familiarity with the series. What was immediately apparent to me was just how beautiful the game is. The original games were about small, dark, and tight corridors that occassionally opened into giant rooms or into space itself. The opposite seems true for the demo level, which starts out with Isaac and John in a crashed ship. While visiblity is low because of a blizzard, at times the snow cleared up to reveal a vast alien landscape. The snow also served another purpose, it allowed enemies to jump out at you from below - and that yielded one of the few times I "jumped" in the demo. Graphically the environments look gorgeous and the character models look really slick. Both Andrew and I commented on the awesome animation that occurs when Isaac or John's helmet engages. Everything feels more colorful, but the game still has muted color palette. While the demo level didn't really showcase any dark environments, the end movie that teased the full game showed off plenty. Combat felt familiar to me, you'll still be targeting limbs of necromorphs and lopping those off as quick as possible. The weapons are definitely the new centerpiece of the game, with many pieces to pick up that can then be used to customize the weapon or build new weapons. I managed to build a sort of electric shotgun about midway through the demo. What stood out for me was just how detailed the new weapon looked and how slick the reload animation was on it. On the co-op side of things it looks like all items and pick ups are instanced to each player, so there's no health or ammo stealing - though you can give ammo to a partner. I'm not really sure if there's a revive mechanic, because every time we died, our bodies exploded into a limbless corpse. No, not that. Overall the demo definitely showcased a more action oriented look at the game, though I was reminded by a friend the Dead Space 2 demo did the same thing. Game play is definitely still slow and methodical, though ammo doesn't seem as scarce as it does in previous games. Frankly, for me, that's fine. I was always frustrated by the constant ammo hunt, and I understand that was one way to add tension, hopefully the game is capable of adding it in another way. 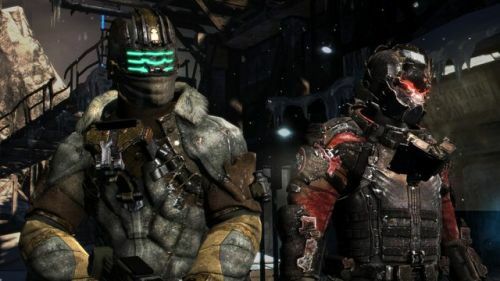 I had a good time blasting through the Dead Space 3 demo with Nick. Years ago I played about two hours of the first game, so it's been awhile. The first thing I noticed was how nice and shiny everything looked, and as Nick said before, the helmet and weapon animations were really sharp. Also, the controls felt very smooth for a third person shooter. We were both armed with two guns, and each gun had two functions, essentially giving us with four weapons. I rolled a shottie/assault rifle combo and didn't have much of a problem. I noticed ammo drops right away and started picking them up. I didn't tell Nick, my reasoning being that he's a better shot than me, therefore he doesn't need as much ammo. We soon realized that each character got their own ammo drops, so I didn't feel guilty. We also picked up several weapon parts along the way. After we killed a few necromorphs, then re-killed them again, we got ourselves familiar with the stomp execution. It's like a Gears of War style badass stomp. The whole camera shakes and everything. So we stomped around on a rocky cliff side in a blizzard for a while, because that's what men with heavy boots do when they're marooned on the bad side of Hoth. We soon found what amounts to the Dead Space 3 version of a janitor's supply closet, allowing us to change our suits and do some weapons crafting. I swapped my red and black Spec-Ops suit for a redder, blacker cold weather suit. I didn't notice any difference other than a change in my physical appearance, but I'd like to think Carver was a wee bit warmer. There might have be a change to some statistic somewhere in the menu screens, but I didn't have time for that. I needed a better gun. Yes, the playable demo is from the E3 2012 gameplay video seen here. There was also a work bench where we could upgrade and create weapons. This is where co-op play might piss some people off. Well, impatient people at least. Each weapon can be upgraded with up to eight circuits, and then there are eight other slots that can be used for fabrication. I foresee some tense "Let's go, already!" moments between people who want to hurry up and shoot, and others who like to tinker. We seemed to have plenty of upgrade parts and ammo, so much so that I think they may have tweaked the demo with extra supplies. Anyway, we went back out into the snow and Nick got killed by a big tentacled monster. The checkpoint immediately put us back in action. This time we used our nifty stasis abilities and slowed it down. I saved Nick from the monster with a few blasts from my shottie. It went down easy. So easy, in fact, it seems that the checkpoint may have accounted for damage we did to it before poor Nick got squished. We continued through the demo, stasising, stomping, and shooting our way through necromorphs and enemy soldiers. There's a pretty intuitive cover system that kind of pulls you to close cover, but doesn't stick you to it. As Nick said before, we didn't see if there was a revive mechanic, because every time he died he got squished or torn apart or 'sploded some how, so there wasn't much left to revive. I didn't die at all, because I hid behind Nick. The checkpoints were really forgiving. There didn't seem to be a penalty for dying, which doesn't help with the horror theme. The only bad thing about the demo was the lack of any real horror or tension. When you play a game like this with a partner it kills the suspense. I pretty much played as a back up for Nick, so stuff would jump out at him or try to grab him, and I'd shoot it. I might have had a different experience if took the role of point man. Either way, as I've stated and tweeted several times now, the Dead Space 3 demo upgraded the game from a "maybe" to a preorder. Now I have to play through the first two games.